Having put quinces through their baking paces (adding them to crumbles or baking them with honey) I wanted to see how else I could use them. Steeping them with gin seemed like a logical step; the unique flavour of quince I thought would work really well, and it does. I set about making some quince gin and I made a little film about it too. It’s the first film I’ve made and I have a new YouTube channel too, check it out below! 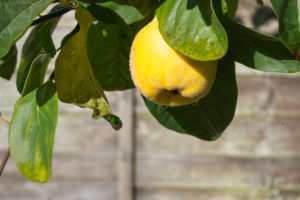 Use some delicious quinces to make a fantastic golden gin with a wonderful flavour. Start by quartering the quinces and remove the cores. Put the quince quarters into a sterilised jar. Add the sugar to the jar then top up with the gin. Give everything a mix together then leave to steep in a dark place for around two weeks. Strain the gin into another sterilised container and enjoy with tonic. If you felt so inclined, you could use the gin soaked quinces in a crumble, or you could cook the whole lot down together, puree it and keep it in the freezer to add to various puddings as and when you wanted. I added less sugar to this gin mix than I would for making sloe gin because the quinces add a little more sweetness. The quinces near the top do start to go brown if they are exposed to the air but I don’t think it affected the taste at all. I love the light golden colour that the finished gin has and the delicious, almost tropical taste, the quince gives. This is just the tipple for cold, dark nights with your thickest slippers and a cosy blanket. this is really easy , the film is so useful! i am heading over to youtube to subscribe now. A very different and creative use of this Fall fruit! I love the idea of using soaked fruit for a crumble. I have never baked/cooked or anything quince before. I am sold on this whole gin idea, looks so amazing! What a totally cool idea… if only I could get quinces here! I know they are grown – I just have only seen them at the market once. What a great idea for when you have an abundance of fruit! 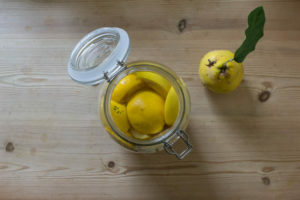 I never knew what to do with quince before and tried it pickled and it was fabulous! I think this sounds like a wonderful idea! I have never made anything like this. So delicious as a digestive after dinner! I love quince! This is really interesting. I’ve never cooked with quince at all. 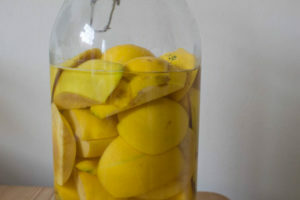 This idea of making quince gin is so creative. A fabulous way to enjoy quince! I really am intrigued when the idea of baking with the gin soaked quince! I thought it would go pink but it’s actually a lovely pale yellow colour. Quite delicate. I didn’t know that gin could be flavoured with fruit like that- I thought that gin came out of a bottle and that was it! I remember once reading Walt Whitman’s poem ‘O Captain! My Captain!’ and tears rolled down my cheek. I believe that gin is a depressant, but I think your recipe might add a little more joy to this beverage! Gin is such good stuff, isn’t it? Great flavor. Bet quince gin is wonderful — may need to make a batch. Thanks! get outta town….what a great idea. i want some now. I hadnt seen this website and I made quince vodka last year! I’ve still got a little drop left and it’s delicious – although I did have to sweeten it quite a bit as the quinces I used were a small round variety and very sour! I’m going to try the gin this year as I imagine the quince will compliment the juniper and herbal flavours of the gin nicely in a G’n’T! ? Do let me know how you get on and what you think! What size jar do you recommend for these quantities? I used a two litre jar for this recipe, if you use a slightly larger or smaller jar then you can adjust the sugar and gin as needed. I’ve just made this and it’s lovely. I know it won’t last long as we will drink it, but if I didn’t drink it all how long would it last? So pleased you’ve made it and love it! When I make it I’ve kept it for around a month or so and it’s been fine. Can you add the sugar at the end? I had some quince I cut up and threw into vodka, like I do with raspberries (no sugar) It’s been in there 2 weeks and I just found this recipe lol! Hi Shawn. I can’t see why you couldn’t add it at the end as you can then adjust it to suit your taste much more. I hope you enjoy it!